In order to speed up the process, please complete your Patient Information Sheet ahead of your consultation - the sheet is included in the confirmation email that was sent to you. If you are unable to complete the sheet in advance, it can be completed when you arrive at the clinic. When possible, make sure to wear glasses (and not contacts) the day of your consultation, unless otherwise directed by the Education Department. Please be advised that your pre-operative consultation will take, on average, an hour to complete. Eye drops will be used in order to perform certain tests, therefore possibly making your eyes sensitive to light. With that in mind, please consider bringing a pair of sunglasses with you to your consultation. Some eye drops may also result in temporary blurred near vision, for a few hours afterwards. Please note that some eye drops are not recommended for administration to pregnant women. If you are pregnant, we ask that you notify us upon arriving for your consultation. Please advise us upon arrival if you plan to return to work following the exam, so we can execute your consultation exam accordingly. In the first part of the consultation, you will be given a thorough eye exam. Your eyes will first be mapped using the latest technology that provide customized measurements of your eyes: Pentacam and WaveScan. 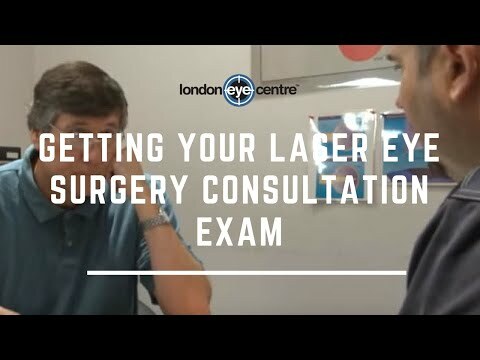 One of London Eye Centre’s experienced technologists will then perform a complete eye exam consisting of familiar eye tests and additional measurements unique to planning a laser procedure. In some cases, you may be given eye drops that dilate your pupils. Once your eyes have been thoroughly assessed, the technologists will determine your eligibility, discuss which procedures (‘No Touch’ PRK or Intralase SBK) are suitable for you, counsel you on healing and recovery, and explain the outcome of the procedure. If you are over the age of 40, the technologist will also educate you on the option of monovision (sometime referred to as blended vision) to address natural aging. In the second part of the consultation, one of our knowledgeable education counsellors will walk you step-by-step through the process: how to prepare for your procedure, the day of treatment, post-operative care and expectations. Finally, scheduling, fees and payment plan options will be discussed. Consultation measurements are valid for 6 months from exam date. Out-of-town patients can have a consultation performed with a local optometrist in their home town. London Eye Centre reimburses up to $80 in the form of a surgical fee reduction to cover the cost of out-of-town consultations. London Eye Centre is not treating USA residents at this time. Consultation hours at our New Westminster location is Monday to Friday from 9am to 5pm. We are also available on Tuesday evenings (until 6:30pm) and Saturday mornings. The consultation hours at our North Vancouver location is Tuesday, Wednesday, and Saturday. To book your free consultation, give us a call at 604.526.2020, or click here to submit your request online.